Wednesday was a big day for top prospects. Tommy Hanson, the Atlanta Braves stud pitching prospect was called up and will start for the Braves on Saturday. 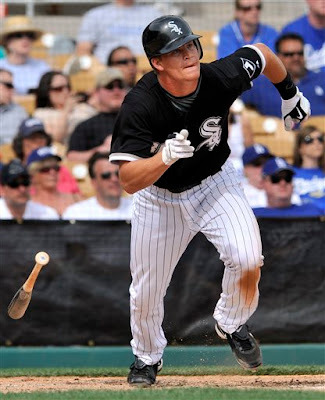 Gordon Beckham, the stud shortstop prospect of the Chicago White Sox was recalled and will start nearly everyday at a variety of positions. Andrew McCutchen, the stud center field prospect for the Pittsburgh Pirates will now roam the major league outfield. Tommy Hanson was called up by the Braves as part of series of moves. They traded for the Pirates' center fielder, Nate McClouth. Then they released 305-game winner, and future Hall-of-Famer, Tom Glavine. It seems this was mostly a cost-cutting measure as Glavine was due a significant bonus when activated. This move looks pretty classless to me. I understand that business is business, but Tom Glavine deserved better from the Braves. These are not the Braves they used to be. Kris Medlen was scheduled to start on Saturday against the Milwaukee Brewers, but has been moved to the bullpen in favor of Hanson. Hanson has been dominating at Triple-A Gwinnett. He was clearly ready to take the next step in his development as a potential major league ace. Despite his potential, Hanson is still more likely than not to suffer through the ups and downs that all young starters experience. That said, you would be a fool not to pick him up, especially if you have the ability to stash him on your bench. Milwaukee is an awful tough team to face in your first start. He induces a lot of infield fly balls. He is fairly neutral as to whether he is a ground ball or a fly ball pitcher but take out the infield fly balls and he leans more towards being a worm killer. He does a very good job of keeping the ball in the park. The Pittsburgh Pirates filled the gaping hole left in their lineup and in center field with top prospect, Andrew McCutchen. He was probably ready to get a shot at the major leagues but he is more of a leadoff hitter than a middle of the order player. He's been compared to Ricky Henderson a lot, but that is tremendously overstating things. He should get on base at a decent clip and steal bases, but he won't be the kind of roto-guy that can get you 12 points in steals all by himself. This leaves the Pirates lineup seriously lacking in power hitters. I understand why the Pirates would want to trade McClouth. They can't really expect him to be a part of their next contending team which is probably still three or four years off. But McClouth was signed to a very reasonable deal. They should have shopped him around rather than trade him so quickly. To trade him for second tier prospects cheats the franchise and the fans. One top prospect would have been a much better deal for them than multiple prospects. Especially when they already have a roster (at more than one level) full of similar players. If the Indians can get Matt LaPorta for a couple of months of CC Sabathia, doesn't a cheap and signed McClouth have a similar value? Let me tell you how much I loath Ozzie Guillen, the White Sox manager. A lot. He's a complete idiot. The first thing he does when the White Sox announce that Gordon Beckham is coming up (a move Guillen has been very much against) is try to crash the kid's confidence (I don't think it will work, but that is not the point) by telling everyone that he questions Beckham's ability to play at multiple positions. He also refuses to just give the kid a spot and let him stay there. Instead he'll rotate around the infield so that Chris Getz of all players can stay in the lineup. The White Sox will be much better when they get off their butts and fire Guillen. No manager has ever deserved it more. To make room on the 25-man roster for Beckham the Sox have designated Wilson Betemit for assignment. Tough to believe they won't find a trading partner to take on Betemit. He could find himself back with the New York Yankees. Beckham is a very disciplined hitter for such a young player. He does not strike out much. He doesn't draw many walks but when you're hitting .458 at Triple-A, why bother? He should hit for decent power (in the 10-15 range) and steal more bases (that's Guillen's thing, stealing bases) than he did in the minors. I'm a White Sox fan, and first off- I do like Ozzie Gullien as a manager. But, that's not why I'm commenting.. I'm commenting because I agree with you- it does seem that Ozzie has been very sour with Gordon Beckham, to say the least. It's very interesting. I'm waiting to see what will happen with regards to this sourness. During the press conferences, when the media asks about him, he says those comments and they leave it at that. Someone needs to stand up and press him (no pun intended) on why he is so sour. At first, I thought it was kind of tongue-in-cheek. But I now realize that this is real, that there is real bitterness. I'm sure its not easy to hear your manager call you "bad" after your first major league game after you've played only 40-odd games in the minors. I hope Beckham is as strong as they say he is, and that this doesn't get into his head. I'd hate to see yet another first-round draft pick by the Sox to go to waste. The Pirates Trade Nate McClouth for Prospects! Fantasy Baseball Arbitration - What is Collusion? Time to Dump Manny Parra?